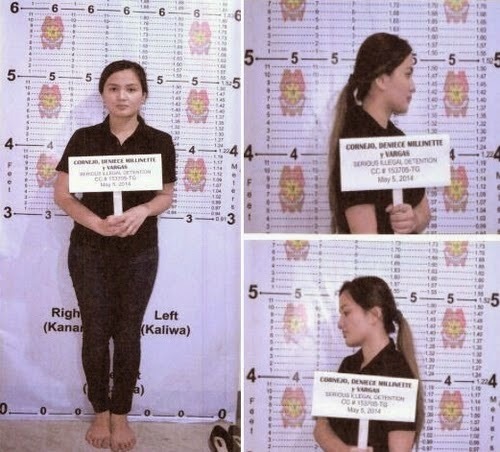 Deniece Cornejo surrenders; PNP releases mug shots of Cornejo - Balita Boss! Commercial model Deniece Millinette Cornejo surrendered to Philippine National Police (PNP) Monday afternoon, May 5, 2014. Deniece Cornejo is one of the accused in the serious illegal detention case in connection with mauling incident of TV host-actor Vhong Navarro on January 22. According to ABS-CBN News, Cornejo arrived at Camp Crame in Quezon City at around 4pm., PNP Chief Supt. Reuben Theodore Sindac said. Then she was brought to the office of PNP chief Allan Purisima to discuss here surrender. Cornejo was accompanied by her granduncle, former GMA network executive Rod Cornejo and his legal counsel, Atty. Ferdinand Topacio when she went to the PNP Headquarters. After Cornejo surrendered to the authorities, her mug shot was released by the PNP to the public on Monday night and it surfaced online. Cornejo, businessman Cedric Lee, and their alleged accomplices became fugitives after the Taguig Regional Trial Court ordered their arrest on April 21. Navarro charged Cornejo along with Lee, Simeon “ Zimmer” Raz, Ferdinand Guerrero and Jed Fernandez, with grave coercion, serious physical injuries and serious illegal detention, which is non-bailable. Raz and Lee were already arrested by NBI agents last April 27 in Eastern Samar. Fernandez and Guerrero are still at large.